Focal Point Focal Point Forums WebFOCUS/FOCUS Forum on Focal Point [SOLVED] First Release of AppStudio? 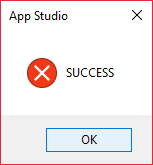 [SOLVED] First Release of AppStudio? When was AppStudio first released? In what version was it released? I think it was 8.006. Quick Reply to: [SOLVED] First Release of AppStudio?